So yesterday Max was staying in school for an extra couple of hours at a club so I decided on a whim to take Lucia to the shoe shop – the one we always go to – on the off chance that there might be something other than Converse to fit her. We do this every few months, just in case there might be a new style that just happens to work. Lucia always gets excited going to the shoe shop to get her feet measured and up until now has thankfully never been disappointed when we leave empty handed. And the last few times I have been ok too as we have got used to it. But even though I no longer have any real expectations I still always have those little butterflies that maybe, just maybe, this will be the day. I really wanted yesterday to be the day because for the first time Lucia had asked for new shoes. She wanted purple shoes with sparkles – the same as her best friend in nursery. I knew the shoes she was talking about and I knew they weren’t a style that would work for her, but I just said we would wait and see if the shop had them. So as we drove into town, the butterflies were there. And guess what – YESTERDAY WAS THE DAY! As soon as we arrived she headed up to the children’s area and straight to all of the lovely girly sparkly shoes. While she had a little look I spoke to the assistant and briefly explained Lucia’s Lymphoedema, but she remembered us from a previous visit. She was wonderful. She measured Lucia’s feet and disappeared into the stock room to look for possible shoes. The first pair she tried was a cute little ankle boot – and they actually went on and the velcro closed over! This was a first! But they came up too far on the top of her foot and pressed on the front of her leg restricting fluid flow and the boot part was too short and tight around her ankle. So she then tried her with a longer boot – but her foot wouldn’t go in ’round the corner’ if you know what I mean. Meanwhile I had spied the cutest pair of Clarks calf length pink boots with a bunny on it. I picked them up fully expecting the assistant to say no – but she didn’t. She went and got Lucia’s size. She put the left one on first and zipped it up no problem – Lucia’s left foot has always fitted anything. And then she squeezed her right foot in and zipped it up too, right to the top! I could hardly believe it. It was a real Cinderella moment! 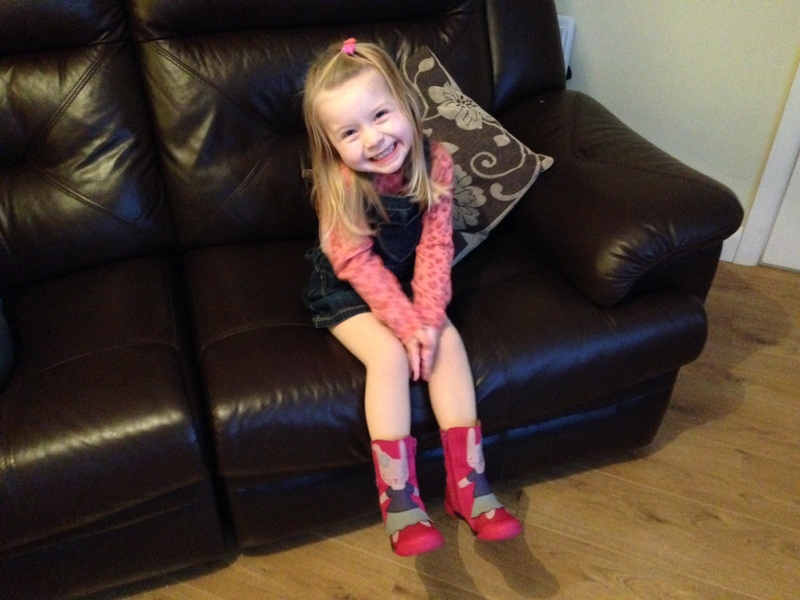 Lucia was straight onto her feet and dancing around the shop, loving these brand new boots! I was so happy watching her spinning around that I thought I would burst. Seeing the joy on her little face was contagious and even the assistant could see just how special this moment was. Of course I was worried that they were too tight and that they would restrict the flow of the fluid, but she checked the fit and got a second opinion and they were fine. They were snug, but not stop the fluid snug. And because they are leather they will stretch with wear. Most importantly of all though, Lucia was comfortable in them and we could see by the way she was walking around the shop that they definitely weren’t too tight – and she was in boot love. They just couldn’t be more perfect! Her favourite colour is pink and she loves bunnies – and these have both. They are made of leather and suede and are her first ever boot! They will be brilliant for keeping her little tootsies warm throughout the Autumn and Winter as her feet have already been getting cold in her Converse. So yesterday was wonderful and once the bunny boots were on they weren’t coming off again. And she was definitely running around with a spring in her step as she showed them off. It really is the simple things that mean the most. I know I have said it before, but whoever thought a pair of boots could bring such happiness? It’s just another one of those things that we all take for granted – until it becomes something almost impossible. So if anyone is interested in trying them click here for all the details on the Clarks website and hopefully they might be good for someone else too. Lucia’s feet and legs are in fantastic shape at the moment – the best they have ever been which has definitely contributed to her fitting into these boots. I will blog on this very very soon so watch this space! Can you believe it is October already? There is a very autumnal feeling here in Northern Ireland with trees displaying their leaves in stunning shades of red, orange and brown. We have been out for walks to collect the leaves that have already fallen, enjoyed crunching them under our feet and hunting for acorns too. Such a lovely season and both Max and Lucia are learning all about it school. So the first month of the new school year is over and it has flew in. Both children have been really enjoying their time with their friends, learning and playing. 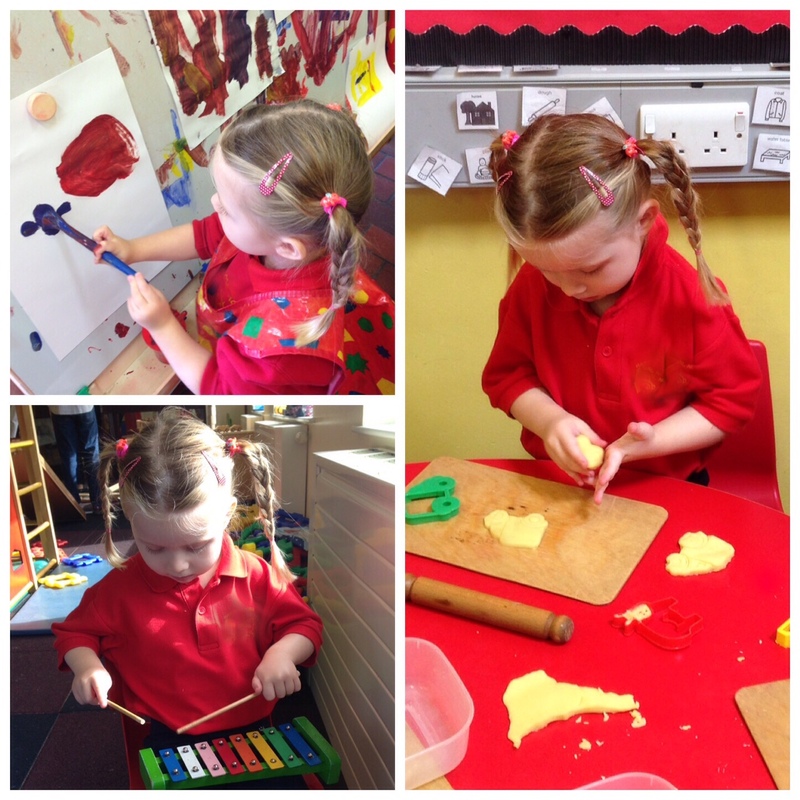 Aside from a few mornings last week when Lucia shed a few tears on the way in (a little bit of separation anxiety), once she is in class she absolutely loves it – and most days she still skips in with her pigtails bouncing. She comes out talking about her new friends, playing inside and outside, her favourite stories as well as maybe a word or two about a naughty boy in class! As for her Lymphoedema, her teachers are completely on top of it all and as I have said before in previous posts we have no worries on that side of things. The nursery teacher has organised a fantastic system with her assistant for doing a ‘tights check’ every day and between them they check her every half hour or so and give her a pull up. They also change her into her ‘outside’ trousers for playground play which have the knee patches ironed onto the inside for extra protection, helping to keep all our minds at ease. She has had one fall so far but no cuts or scratches – just a wee bit of a shock for both her and her teacher! When Mrs M told me at pick up time I think I asked if she was OK before Lucia as I know how much I freak out if Lucia takes a tumble. Lucia then decided one day to have a little adventure in the sand pit with one of her new friends. I don’t know if they were pretending to be at the beach or not but they both took off their shoes and went for a play! Mrs M said she saw the two of them happily jumping up and down together laughing away when she suddenly realised they had no shoes on! Very calmly she got the two of them out, took Lucia’s trousers and tights off, washed her, dried her and changed her into new compression, trousers and shoes. And she did a fantastic job as there wasn’t a grain of sand on her when she came home. She also went that extra step (as she always does) and took the time to explain to Lucia’s little accomplice that Lucia wasn’t allowed in the sand pit without shoes on as it might hurt her toes. Such a great idea. Surprisingly, when I received the text telling me about what had happened I couldn’t stop laughing at the thought of my little rascal getting into mischief! Whereas this time last year I probably would have had a melt down! This last month also brought a very special moment…the first time Lucia has ever talked about her Lymphoedema to anyone other than us. One day, as she was getting her garments pulled up she told her little friend; ‘These are my special tights I wear everyday for my Lymphoedema and they stop my leg getting bigger.’ Just like that. Totally matter of fact. No big deal. When the teacher told me I completely welled up. I suddenly realised how much Lucia has listened and understood when we have talked to her about her Lymphoedema. It showed just how clued in she is about everything at just three years old. I actually thought I was going to burst with pride when I heard how confident she was telling her new friend about it. And her little friend just said ‘ok’, completely accepting it. Kids are amazing at this age. I love that Lucia felt happy to tell someone about her Lymphoedema and that she doesn’t see her compression as a big deal. I love that she told it straight – this is how it is – in such a beautifully innocent way. I love that right now she rarely gives it a second thought and takes it all in her stride – and I long for that mind-set to continue for many many years to come.